Rock carving of ships at a paved gateway to the acropolis. 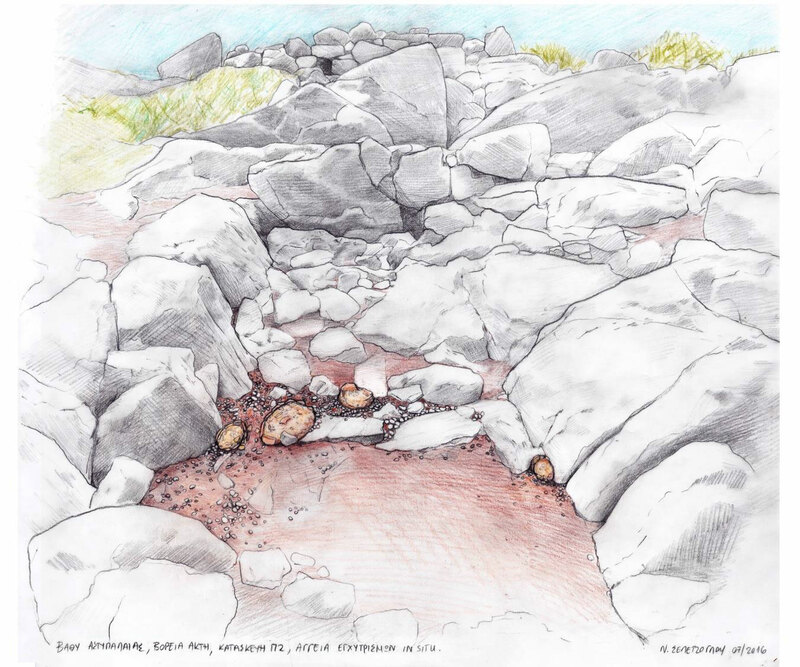 Under the aegis of the Archaeological Society at Athens and with funding from the University of Ioannina, since 2011 Andreas Vlachopoulos has been directing archaeological fieldwork at the site of Vathy on Astypalaia. Vathy is a naturally protected peninsula controlling the narrow access from the open sea to the homonymous gulf, thus ensuring full monitoring of a wide area of sea and land. At the tip of the promontory, on Cape Elliniko, a citadel was founded in the late 4th / early 3rd millennium BC, whose boulder- built circuit walls and retaining walls are still visible today. On the upper level of the headland, a tower with surrounding ancillary establishments was built in the late 4th century BC, but early 6th-late 5th century BC inscriptions from the site testify to the continuity of humal activity. Andreas Vlachopoulos, Associate Professor of Archaeology at the University of Ioannina, will give a lecture about “The Final Neolithic / Early Cycladic site at Vathy, Astypalaia: The rock art and the infant pot burials”, on Wednesday, October 4, 2017, at 7.00 p.m., in the building of the Archaeological Society at Athens (Panepistimiou 22, Athens). 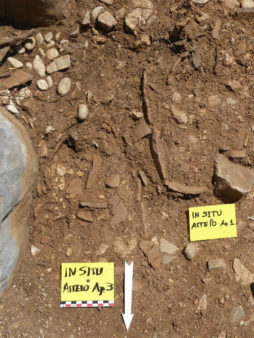 In the course of the surface survey and the excavation of few trenches, a large quantity of diagnostic pottery of the late 4th / early 3rd millennium BC was studied, along with stone tools and vessels, metal objects and other artifacts. Finds such as two violin-shaped figurines and a stone seal of EBA II date redefine the geographical horizon of Early Cycladic culture, demonstrating that Astypalaia was part of its ambit. In these early horizons, which exhibit, on the one hand, a “neolithic” tinge, and on the other, an early connection of Astypalaia with the Cyclades and with the Asia Minor coast, the contribution of pottery is catalytic. Nine infant egxytrismoi (pot burials) carefully clustered in two of the Π-shaped enclosures of the coast (figs. 1-2) constitute a singular and mutually complementary chronological horizon, with the types of pottery dating to the transition from the Final Neolithic to the Grotta-Pelos culture, in Cycladic terms. 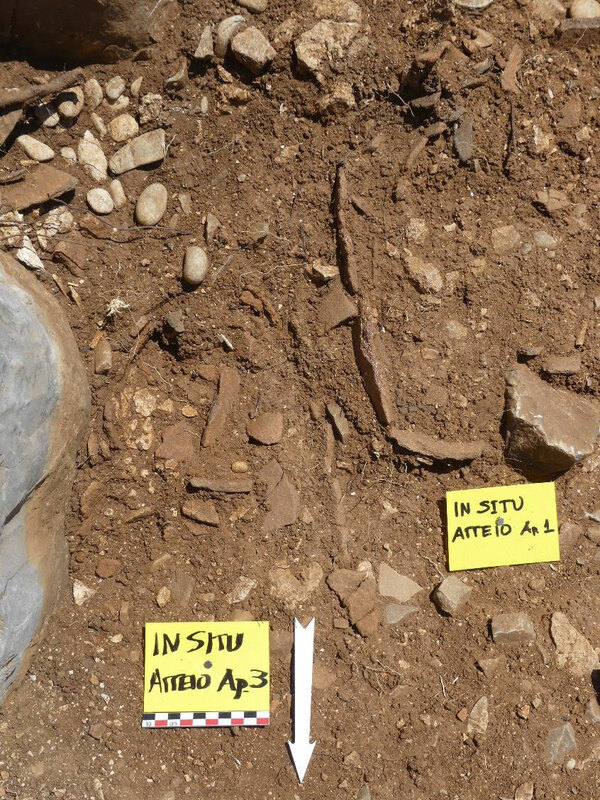 The deposition of stone tools, jewellery, seashells, fruits, seeds and portions of butchered meat around the egxytrismoi document the use of these goods as burial offerings, and shed light on the ritual behavior that it was followed for honouring the dead infants of the community. 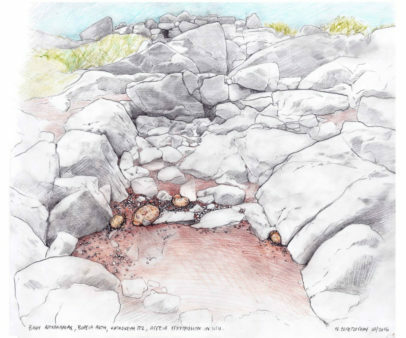 The most important find from Vathy was the recognition and study of a large number of prehistoric rock carvings over a wide area of rocks on the cape, both quarried and natural. 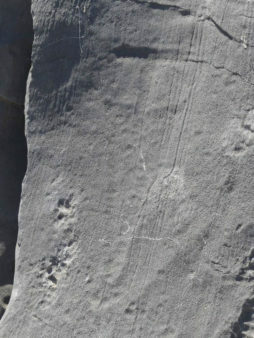 It was ascertained that in three cases of pathways terminating at gateways-entrances to the acropolis there were large-scale rock carvings of ships (fig. 3), daggers (fig. 4) and spirals, which can be distinguished particularly at sunrise. 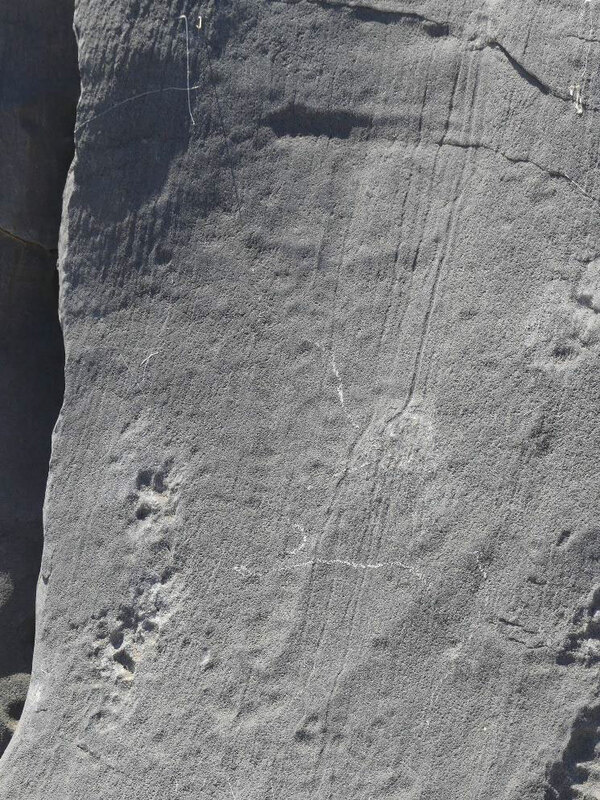 More rock carvings (of humans, quadrupeds, checkerboards, arrows, axes, human footprints etc.) were identified at the retaining walls of the coast, the enclosure wall of the acropolis and the bedrock on the upper level of the cape. The Astypalaia rock carvings create a dense iconographic map of repetitive and meaningful symbols of visual and mental perception, which modern research needs to decode. 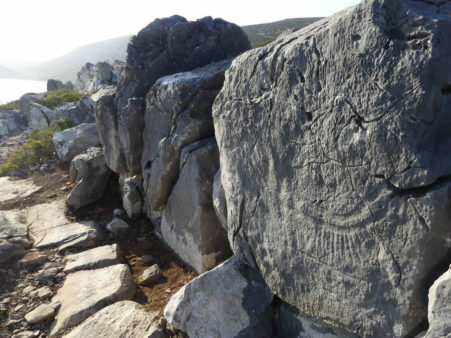 The “reading” of the Vathy rock art motifs, assisted by the earlier rock art motifs of coastal Anatolia and mainly by their Early Bronze Age parallels in the Cyclades, contribute a great deal to our understanding of this pan-Aegean cosmological koine of symbols. The findings at Vathy, their affinities and their chronological correlations, substantiate and verify the crucial geographical position of Astypalaia, as an island-station and a passage-ladder from the Cyclades to the Dodecanese islands and the Asia Minor coast, and vice versa, showing the blending character of the culture of Astypalaia. Vathy combines Cycladic, Dodecanesean, and coastal Anatolian features, without the contacts with Astypalaia being exhausted in these areas.